Tagged with Admissions, UK, UniQuest. UniQuest has announced the first findings of its ongoing research project into “stealth applicants”– mysterious students that constitute a ‘blind spot’ for university admissions and marketing teams by making no contact with universities before application. These untraceable students are by no means rare. Conducting an analysis of its partner universities, UniQuest found that 85% of students in the 2016/2017 academic year had applied without making any contact before application. 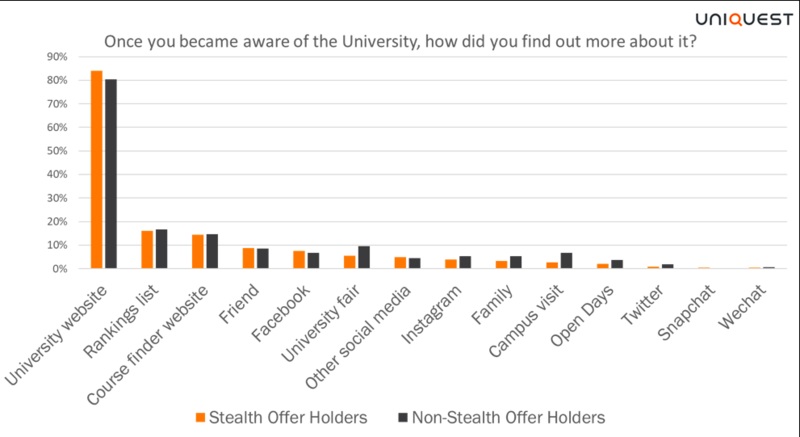 Preliminary results of the research project show that 71% of current international offer holders at UniQuest’s partner universities are ‘stealth’. Stealth applicants also showed a lower offer to enrolment conversion compared to other students: students who made an enquiry before applying had a conversion rate 56% higher. “There is an increasing pressure on International Offices to understand the return on investment of their marketing activity, to spend smarter and be agiler in their decision-making processes,” UniQuest’s director of behavioural insights Jennifer Parsons told The PIE News. Parsons added that as universities are working hard to better understand and manage pre-application and enrolment engagement with students, stealth students, who constitute a significant part of the student body, lack visibility. They may also need unique support at the point of application since they haven’t had the benefit of any engagement with the institution beforehand, she explained. The research will strive to trace their path before application: the channels students used to discover and consider the university, and what factors impacted on their decision, in order to allow institutions to be present with targeted marketing messages and support. “We’re committed to equipping our partners with insights to better inform their strategic planning and this stealth research is a significant part of that given how prevalent international stealth applicants are,” Parsons said. Launched in 2018, the project has so far collected 1,047 responses to an online survey for international offer holders at its partner universities, with students having the option to join panels for further research. This sample excludes international offer holders who have been working with agents, as their journey to application and enrolment will be the object of a separate study. 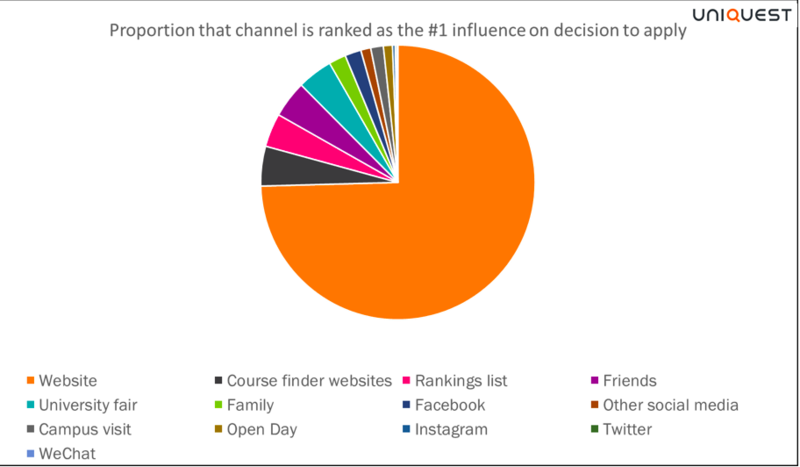 The findings of the ongoing UniQuest research project indicate that an institution’s website is the biggest influence on students’ decision to apply, while social media has relatively low weight. Google Search comes up as the top channel through which stealth applicants find out about the university, especially for postgraduate students. These findings resonate with Google’s decision to include more information about US universities directly in Search, a feature it has recently launched. 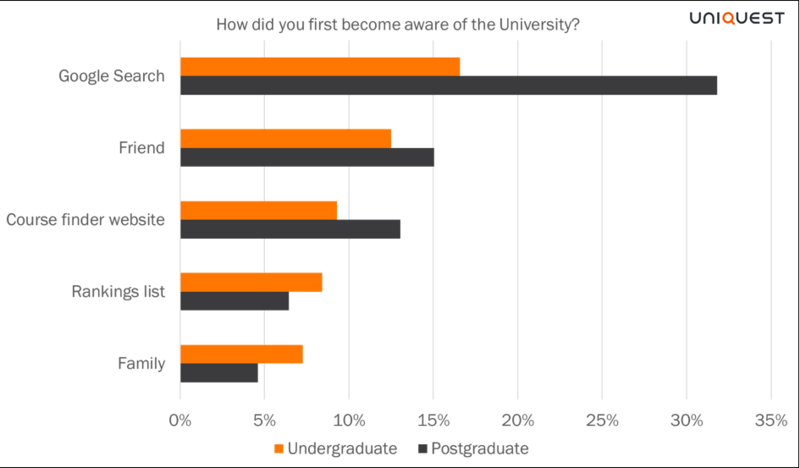 Once aware of the university and its courses, students overwhelmingly said that they used the institution’s website to find out more information about it. The second and third channels were rankings website and course finder websites, but these were still dwarfed by the institution’s own website in this sample of students. The university’s website was also rated as the most impactful factor on the student’s final decision to apply by 75% of students in the sample, compared to just 2% for Facebook. “There’s so much hype about the role of social media in student recruitment and while it certainly has a place, it does not replace traditional channels like the university website,” said Parsons.